François M. de Visscher, a native of Belgium, has been an active advisor to business owning families for over 30 years, mostly in the United States, Canada, Europe, the Middle East and Latin America. Mr. de Visscher is a Co-Founder and Principal of FODIS, and serves as its Executive Chairman and Chief Marketing Officer. He has Partnered with James Bly since the founding of Business Growth Alliance (BGA) in 2003. In 1990, he founded de Visscher & Co., one of the world's most renowned independent financial consulting and investment banking firms for family and closely-held companies. Over the last 20 years, he and his team have advised over 300 family companies and family offices worldwide on issues of liquidity of shareholders, capital needs of their business in direct investments. Prior to opening his own firm he was a partner at Smith Barney, where he founded and ran Wall Street's first Family Business Group. In 1998, Mr. de Visscher founded "Family Capital Growth Partners", a private equity fund focused on making equity investments in family-owned and closely held companies. In 2003, he co-founded the Business Growth Alliance (www.bgallc.net), an alliance of middle-market advisory firms and he continues to serve as it's Executive Chairman and Member of BGA's Affiliate Advisory Board. Mr. de Visscher has also served as a director and shareholder of his own family's global enterprise, N.V. Bekaert S.A. Headquartered in Belgium, Bekaert was founded by his great-grandfather in 1880. Today, the Bekaert Group has sales of over $5.0 Billion in over 80 countries manufacturing and marketing a wide variety of steel wire and related products. Mr. de Visscher has been a partner, investor, advisor or director of several private corporations including Olympia Chimneys, Epic Brands in the U.K., and Ambridge Corp. in Colombia. He is a member of the Global Advisory Council to PlayPumps International and an advisor to J.H. Whitney Pan Asian Fund. 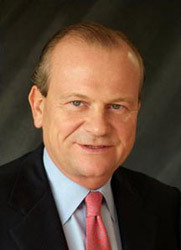 Mr. de Visscher is the past president of the Family Firm Institute, current Chairman of the European Family Office Conference, and a contributor to many publications, including The Wall Street Journal, LA Times, NY Times and many others. He is a full-time contributing editor of Family Business Magazine. Mr. de Visscher is the recipient of the 'Richard Beckhart Award" from the Family Firm Institute in Boston, recognizing his many valuable contributions to the Field of Family Businesses. Mr. de Visscher is a Certified Public Accountant and a member of the American Institute of CPA's. Mr. de Visscher holds a Bachelor of Economics honors degree from Université Catholique de Louvain (Belgium) and MBA from Rutgers University (USA).